Learn to create exquisite textiles, supported by highly experienced textile designers and using our first-class digital and traditional knit, print and weave facilities. With industry opportunities integrated into the course, this degree is superb preparation for a future in textile design. Whether you are interested in textiles for fashion, interiors or products, the BA Textile Design will nurture your creative, practical and professional skills. Having explored different aspects of textile design in year one, you’ll choose to specialise in woven, knitted or printed textiles, learning traditional manual processes alongside cutting-edge digital techniques. Part of a vibrant, creative art school campus, you’ll have access to superb studio space and equipment, such as Shima Seiki and Dubied knitting machines, a Mimaki printer and a jacquard loom. The programme includes an exciting opportunity to spend a semester working on live company briefs, or studying textile design overseas. You’ll also learn about emerging industry issues through the innovative Textile Futures module. A degree programme at the cutting edge of textile design, the BA Textile Design is rooted in WSA’s longstanding tradition of excellence in textiles. We teach the latest digital techniques as well as traditional manual processes, encouraging you to explore ways to use old and new methods in innovative ways. The relatively small intake on the course means we can offer a high level of support, helping you to become an accomplished designer and researcher with high-level practical skills. This is a three-year, full-time degree course, with two semesters per year. You’ll have the freedom to experiment with different media in year one before choosing a print, knit or weave pathway. During year one you’ll develop the practical and intellectual skills that will underpin your future studies. We will introduce you to the fundamentals of textile design through practical workshops and hands-on assignments. You’ll be able to try out knit, print and weave processes so that you can choose the right pathway for you. Alongside this, you’ll learn about the importance of research as a foundation for creative work and gain essential research skills. In semester two the emphasis is on materials; you’ll be encouraged to explore and experiment with combinations of fibres, yarns and fabrics. You’ll also take the distinctive Textile Futures module, which examines the latest issues facing industry, such as sustainability and ethical practice, giving you a more informed view of real-world challenges in the textiles field. In year two you’ll develop your skills further, exploring and experimenting with ideas with the aim of developing your own informed, independent practice. In addition, you’ll learn more about cutting-edge technologies such as CAD (computer-aided design), digital and sublimation printing and laser cutting, and how to use them in combination with traditional techniques. Semester 2 your second year also includes the exciting opportunity to study overseas or to work on competitions or live industry projects, in the Professional Practice in Textile Design module, which involves developing work for company briefs and provides valuable experience for your CV. For example, you might design fabrics for a particular product range or sector. You’ll learn from visiting textile designers and receive professional feedback on your work. Alternatively, you may spend a semester studying abroad at a partner university. A fantastic opportunity for academic, creative and personal development, studying abroad will enable you to gain a different perspective on textile design. You’ll make new friends and contacts while immersing yourself in another culture. We have partners in a number of countries including Japan, Sweden, Germany, France, Canada, Denmark, and Spain (teaching is in English). You can personalise your course further in year two through your choice of optional module. You can select from a range of modules on different aspects of creative and professional practice, to suit your interests and career goals. Topics include problem solving, visual culture, digital culture, entrepreneurship, sustainability and marketing. In year three you’ll have the freedom to choose your own brief and put your learning into practice in the Professional Textile Practice module. You’ll work towards creating professional-standard pieces and a portfolio for your final major project, informed by in-depth research. You’ll reflect on your practice through written assignments as the year progresses. The year culminates in an in-house showcase of students’ final project work in Winchester. In addition, our most talented students have the opportunity to show their work in London – in previous years at New Designers in London. We recognise that research is the cornerstone of good design, teaching you the creative research skills that are crucial on the course and in the workplace. In addition, you can benefit from being part of a research-intensive Russell Group university by participating in interdisciplinary projects that bring together ground-breaking scientific research and textile design. For example, a current project is looking at smart textiles, working with experts from computer science, neuroscience and medicine to explore the idea of textiles to aid healing and recovery. We have extensive connections across the spectrum of textiles organisations, including major designers and suppliers. For example, we have links with Alexander McQueen, Colefax and Fowler, Cath Kidston, John Lewis, Liberty, Monsoon and Osborne and Little. All our staff have extensive textile industry experience and are practising professionals as well as expert educators. Programme leader Deirdre Campion has industry and commercial expertise within fabric printing, wallpaper design, design for embroidery and decorative pattern for jacquard weaving. She has worked with high-end furnishing brands as a designer and design director. Initially trained in Ireland, followed by a design history masters from the Royal College of Art and Victoria and Albert Museum, she combines modern textile techniques and innovation with archival research for interior use. Her teaching is underpinned by her interest in drawing as fundamental to design in both modern digital textile design and the traditional methods of hand produced screen-printed design. Helga Matos teaches has technical expertise and experience of dobby, harris, arm and jacquard looms. She studied at Winchester School of Art before completing her MA at the Royal College of Art in 2008. She has gained international experience working in the textiles industry and won several awards for her unique approach to woven textiles. Helga is inspired by materials and technical textiles and looks into environmental psychology to develop her concepts. She regularly works on collaborative projects with product designers, interior designers, artists and fashion designers. Sarah Cheyne’s designs for fashion fabrics, home and giftware sell to clients in Europe, the USA and Asia. She currently runs her own successful textile design studio specialising in printed textiles, embroidery and illustration. The design collection sells to a variety of clients from manufacturers to high street retailers and at pret-a-porter level. Sarah also works closely with clients to produce designs to commission, and develops print ideas for production as a print consultant. Develop high-level skills in knit, print or weave and pursue your own creative textile design projects. Learn the latest digital techniques alongside traditional manual methods. Generous studio access and an unrivalled range of equipment including Shima Seiki and Dubied knitting machines, a Mimaki printer and a jacquard loom, as well as manual facilities. Choose to spend a semester working on industry projects, doing a work placement or studying abroad. Taught by academics with extensive professional textile design experience. Exposure to industry throughout the course, through guest lectures, study visits and competition opportunities. 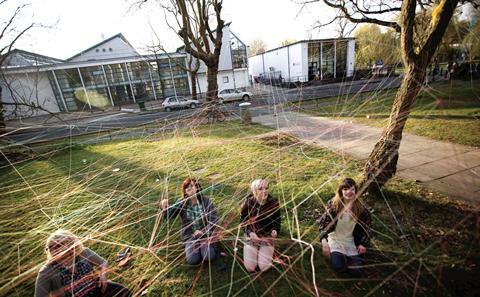 Study in an inspiring art school community within a Russell Group university, with easy access to London. Our graduates’ career destinations include Alexander McQueen, Cath Kidston, Colefax and Fowler, John Lewis, Osborne and Little, Monsoon and Liberty. GCSE Winchester School of Art requires all applicants to achieve at least a Grade 4 (taken in England) or a Grade C (where taken in Northern Ireland or Wales) in English and Mathematics. If you are taking an alternative qualification please contact our admissions team via ugapply.FBL@southampton.ac.uk. Applications should be made via UCAS. Applicants who meet our minimum entry requirements will be invited to attend an individual portfolio interview. We conduct portfolio interviews from December onwards. For the most up-to-date admission information, please check the UCAS website. Find out the modules that you will be studying. In Part 1 you will have the opportunity to experiment with ideas and ways of working that underpin textile design. At the end of Semester 1, Part 1, informed by this experience, you will be asked to select a specialist pathway to study from one of the three textile design areas; knitted textiles, printed textiles or woven textiles, which you will then study from Semester 2 to the completion of the programme. Academic staff will advise in your selection of pathway. You will also be offered guidance on your selection of a career-orientated Optional core module for Part 2. The career-orientated Optional core modules are designed to enable you to tailor your programme to suit your choice of a career path. Depending on which pathway you opt to take and by successfully completing modules, your studies will lead to the award of BA (Hons) Textile Design distinguished by the specialist pathway you opted for. i.e. BA (Hons) Woven Textiles. By Part 2 you will have established an extensive grasp of a range of practical skills and an understanding of what informs and contextualises ideas and practices in textile design. You will now be encouraged to explore and experiment, speculate and test your ideas with the aim of developing you into an informed, skilled, independent designer and practitioner. The module choices will provide you with the creative freedom to explore areas outside of your main specialism. Part 3 will combine your skills development of the preceding years study in your application to Textile Design and develop your personal interests and advanced creative responses in preparation for the development of your degree collection. By the time you have reached this part you should be working competently as an independent practitioner. Strong employability skills are embedded through the written Professional and Industry Context module. The Final Major Project in Semester 2 allows you to develop an ambitious and personal approach to your design portfolio for exposure to an audience at public shows and events including clients, employers, industry practitioners and press. This degree is designed to meet the needs of textile companies, who are looking for graduates with technical skills but also the ability to think creatively and find inspiration for new collections and products. With a comprehensive understanding of industry, real-world experience and a portfolio that showcases your talents, you’ll be highly employable when you graduate. Our students gain roles as design assistants, colourists, illustrators and interior stylists. Others have gone into trend prediction and textile buying. You’ll learn through creative studio-based assignments, supported by practical workshops, developing the research and practical skills that will prepare you for your future career. You’ll also attend lectures, seminars, one-to-one tutorials and group tutorials. Additional learning opportunities include interdisciplinary design projects and workshops, and visits to design studios and textile manufacturers in the UK and overseas. Formative feedback is given throughout the course, enabling you to identify strengths and areas for improvement before your work is formally assessed. You’ll be assessed through coursework, which will include your portfolio, academic and reflective writing assignments and your final major project pieces. Students who take the industry placement option are required to complete a project and write a report, and we receive a report on each student’s performance from the placement company. If you take the study abroad option, we will assess the work you do while at the overseas institution. We provide plenty of support to our students, nurturing their talents and enabling them to fulfil their creative and professional potential. It’s a relatively small course in terms of student numbers, which means we can get to know you as an individual and offer tailored help and guidance. You’ll have extensive access to studio space and equipment, and lots of contact time with teaching staff in the studio and at one-to-one tutorials. You can also book time with staff during their weekly office hours if you have queries or need some extra support. Our dedicated technicians and library staff are on hand to help you learn new techniques, use studio equipment or find publications to support your research. In addition, every student is allocated a personal academic tutor who can advise on course-related or personal matters, or direct you to a range of welfare and support services run by the University and the Students’ Union.